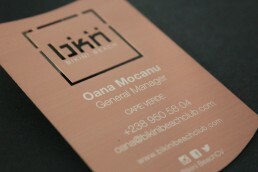 Silk print is the standard method for adding details on to your metal business and membership cards. We can print just about any colour and therefore match your branding. Silk print can also be in larger areas to create a subtle picture or pattern. Black silk print has been used on the matt black card on the left. Available on all metal business and membership card styles. Laser etching is available on our matt black and white cards. This process removes the matt surface to expose the metal below. Simply put, it looks stunning. 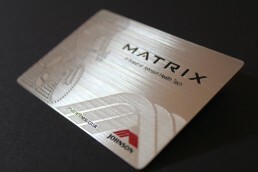 Available on our matt metal business and membership card styles. Before applying the matt surface we can etch the metal with a custom shape or pattern. Your logo, in a pattern using this method, can reinforce your brand's image. By etching a channel before applying our special silk ink, we can ensure longevity and enhance the tactile qualities of the card. This production method is available on all metal business and membership card styles. No explanation needed! 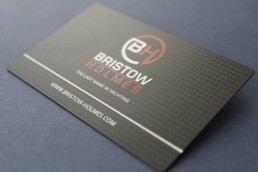 By cutting out part of your logo or other shape, we can be 100% positive your metal business card is unique. Your metal business cards can be a cut to a custom shape if required - why stick to conventions when you want to stand out? 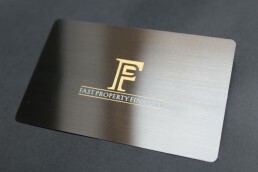 Our full colour metal business cards can match your existing branding to achieve a lasting impression and introduce your company’s recognisable colours or patterns. This can be achieved by two different printing methods. Full colour UV which is ideal if you have a pattern or gradient. Or alternatively, we can print a single colour in silk print. See our full colour metal business cards for more details. We can print sequential numbering for your metal membership cards for no additional cost. Alternatively, we can print your custom numbering from a supplied spreadsheet. Available on all metal membership card styles. Want to make your customers feel extra special? We can print names supplied in a spreadsheet. QR codes can used to store additional information. Identical QR codes and barcodes can be added free of charge to your cards. In addition, we can put individual QR and barcodes which can store your members name and membership number if required. Magnetic strips, which are compatible with most major EPOS systems that have a strip reader, can be applied to your membership cards. We can supply both LoCo and HiCo in tracks 1, 2 3, which comply with the ISO7810 and ISO7811 standards. The strips are available in gold, silver, brown and black colours. We are open from 10am to 5pm (UK time), Monday to Friday. Have you got artwork to send to us? You can upload this here. Alternatively, you can email us at hello@13thelement.co.uk.